There has been widespread condemnation around the minor scuffle at Bristol University from all sides of the debate. Many just do not see this PR stunt for what it is ,which was to catapult Mr Rees Mogg as a safe pair of hands to take over from Theresa May as future PM. This would not of even normally made the press or attracted any attention at all, if he was not being put forward as Theresa Mays replacement. Often MP’s and Ministers are subjected to heated opposition arguments, but only since the 2010 coalition government have the people of the UK got so angry they have taken to the streets,courts and taken action to challenge directly policies which are harming the population,leaving many without hope of a decent future afforded to their parents and grandparents under the welfare state. The eradication of their rights, lack of opportunity,and being engaged in the political process much more actively since the Corbyn Revolution that nobody thought would happen as socialism was thought to be something from the past sent shock-waves across Britain. This has pitted the have’s and have not’s against each other as the inequality divide widened more than anytime in recent political history since 70’s or longer. Its nasty politics at it’s worst with comments and personal attacks that have lead to the demise of any respectable debate both in parliament and on the street as the government ride roughshod and laugh in the faces of reason,justice,removing common decency of opposing sides yet ironically call for people in today’s society to ‘take responsibility’ while avoiding doing so themselves. They are brazen in their disdain for working people of this country while lacking the understanding of their plight, or their lives generally,the disconnect is so obviously blatant and in your face. This event was set up by the President of UWE Conservative Society Callum Tucker to engage young people to vote Conservative or change the minds of those who are uncertain of where they are on political spectrum. he put a statement out directly afterwards regarding this shameful display of poor judgement and behaviour of all those involved in this scuffle. A statement from the university said the protesters were not UWE Bristol students and had broken into the event organised by the Politics and International Relations Society.The statement said: “We are absolutely appalled by the conduct of a small number of attendees at a Student’s Union Politics & International Relations Society talk this evening. It is our understanding at this stage that a small group of protesters broke into the lecture theatre where the event was due to take place via the back doors. The police were called and our security attended. We understand that these protesters were not UWE Bristol students and did not have tickets for the event. The police are now working to identify the individuals. Once the situation was calmed, Mr Rees-Mogg went ahead with his speech and was escorted back to his car after the event finished. Both security and the police stayed for the event to ensure everyone was safe. We support the democratic right of free speech and peaceful protest. However, we strongly condemn the actions of protesters who disrupted normal debate and behaved in this way. There is no place for such action on a university campus or in a civilised society. We are delighted that Mr Rees-Mogg was able to speak and debate with our legitimate student body in a respectful manner. This image shows clearly the young woman in the middle of this fracas was not punched but non the less was affected by the man in white shirt using his arm to push them back while being grabbed from behind by others close by to prevent further disruption,while a protester since named as Josh Connor lashing out with clenched fist in the kerfuffle. 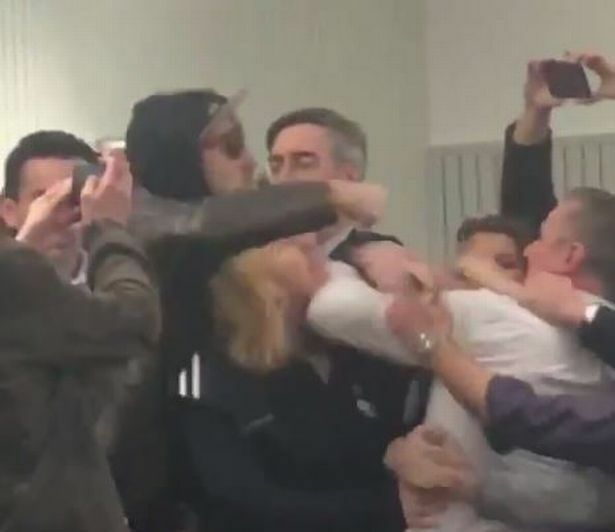 Hasten to add as Rees Mogg engaged with the shouting balaclava brigade of Antifa they slipped quietly out the auditorium ,which was when Mr Connor became vocally confrontational with Rees Mogg joining in the melee of disrupting the debate. 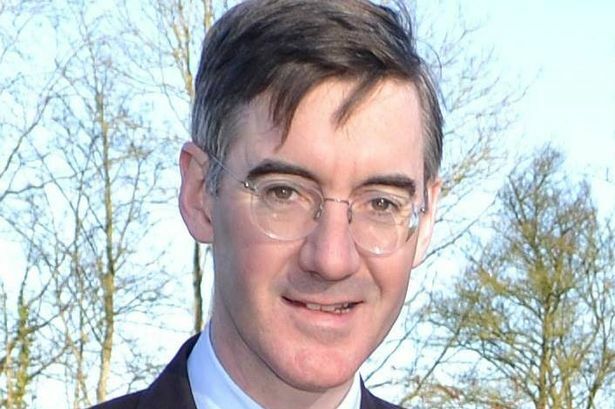 Chris Dixon, 23, who was in the audience, told The Independent: “As soon as they came in, Jacob Rees-Mogg walked straight up the stairs, walked straight up to them to have a conversation with them and try to diffuse the tension. They were just screaming in his face. Chloe Kaye, 19, said: “The audience were getting very angry. Jacob Rees-Mogg was very calm, quite surprisingly, trying to stop all of this and talk to them. People in the crowd were pushing each other. Everyone was getting involved. Everyone was out of their seats. “People were really angry that there were people interrupting free speech. Viewpoint 2 from Breitbart Raheem Kassem who is no lover of Labour and a right wing journo, but look for chap in a white hoody who walks up and intervenes and you will notice it is in fact his hand that hits the female protester, not the one the media is saying did so or the one in the picture below the You Tube link. Then I come to other images floating around which if you watch the above very closely will identify the real culprit of a woman being ‘not punched’ but ‘assaulted’ in process of the scuffle of what can only be described as a major coup for Rees Mogg and his supporters in this PR stunt as a way of presenting him as a safe capable pair of hands and someone to vote for when a challenge to Mrs May comes. Meanwhile while doing this blog it seems that this blogger is being monitored given 6 times I have tried to load up a picture to highlight the truth and in recent days this bloggers Facebook has also gone into meltdown preventing them from posting so even though the snoopers bill is illegal they are doing it for sure to those who are vocal to show their displeasure and what is going on in this country and stifling any opposition to prevent the public from waking up. Not normally paranoid but this does smack of censure. I have campaigned for 8 long years and never had any issues, could it be that this is linked to my recent Submission to the Secretary of State Ester McVey regarding the governments Universal Credit Policy who is promising a response via my MP who happens to be the one who told WASPI’s to get an apprenticeships? Those who try to shut down speakers are afraid of letting students make up their own minds. So if you think Momentum shouldn’t get away with threats and intimidation, then sign our petition today. Now I don’t condone violence on any level as if your argument is sound you can win the debate generally,however when debate is being silenced by any means so the only message the public hears is from those in power you should be questioning the motives behind it. We all know who the bullies were here! UWE a university that takes pride in it’s inclusivity of LGBT stance decided to allow a speech from Jacob Rees Mogg to take place a person known for his homophobic and anti abortion beliefs are well known and documented. Furthermore not only has he downvoted bills that would help poor people and is in favour of privatizing the welfare state he has been also documented to hang out at parties set up by the traditional Britain group, a Islamophobic,anti immigrant group.